Just Chairs Upholstery is a custom service workshop with over 12 years experience re-upholstering chairs, benches, ottomans, and making custom throw pillows and cushions. 1.) Free quotes over the phone, on the Internet via e-mail, Send me several digital photos of your piece of furniture. A front view, and three quarter view that shows the side and the back. Based on the description of the type of chair and/or based on the photos we will give you an estimate as to the labor charges. 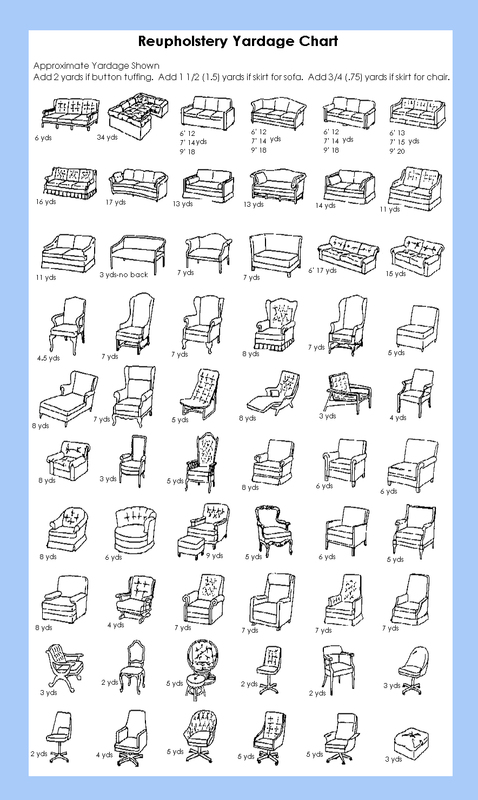 Check upholstery yardage charts like the one below for a basic estimate as to the amount of material needed. 2.) In-Person Inspection: either in our shop or through an in-home visit. All quotes are good for 30 days. 1.) Once we receive your order, you will need to select your fabric. We sell some commercial grade vinyls and leathers but do not sell upholstery fabrics. We allow customers to bring their own fabric (C.O.M. 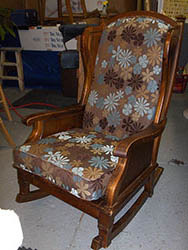 Customers Own Material) There are good sources for upholstery material in SE WI and on the web. (see links)? BAAZAR HOME DECORATING, HANCOCK FABRICS, MANHATTAN TEXTILES, CALICO CORNERS, JO-ANNS FABRIC & CRAFTS, plus on-line sources i.e. FABRIC.COM, INSIDEFABRIC.COM, FORSYTHFABRICS.COM to name a few. 2.) Once you’have decided on a fabric, send me the information such as the width and repeat so I can ensure that you purchase enough for the job as larger repeats require more fabric. Your fabric can be shipped to me at the address shown below. When I get the fabric, I will contact you and go over all the details to make sure everything is correct. Any changes can be made at this time. 3.) General production time for pillows is about 3-4 weeks once we get the fabric. 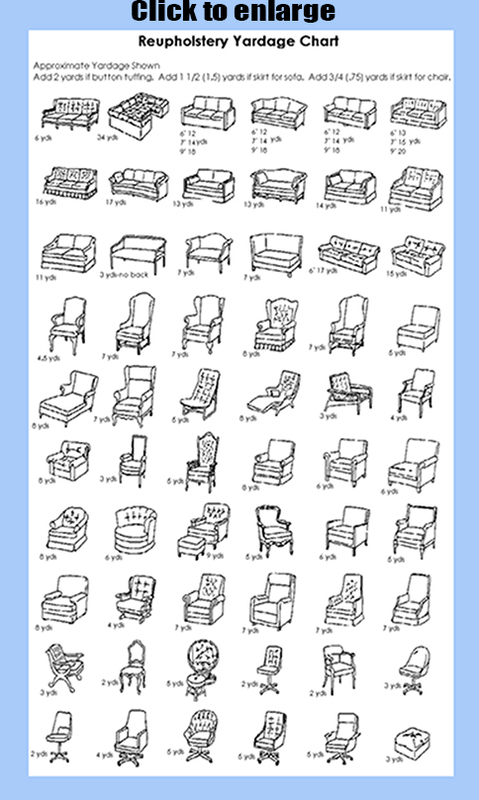 Sofa cushions, patio cushions and furniture such as chairs, benches, head boards and ottomans will take 6-8 weeks. We will do our best to stay within the time frame quote however, life does throw unexpected curves once in awhile, we’ll be glad to work with you when problems arise. 4.) Special pick-up and delivery services are available. 5.) We require a 50% down-payment deposit at the time of production with the balance due when the job is finished. 6.) Sometimes unseen problems arise once we can see the condition of the infrastructure and frame after the material is removed. We will contact you prior to going forward if additional labor and material charges are needed to repair a frame. 7.) Upon completion of the job, we will call you to set up a pick-up date and time. 8.) There will be a storage charge for items left in our shop past 30 days. 9.) 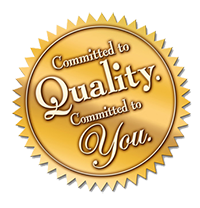 We take great pride in our workmanship and quality. All upholstery jobs are custom. Copyright © 2013. Just Chairs Upholstery All Rights Reserved/ Updated 2016.